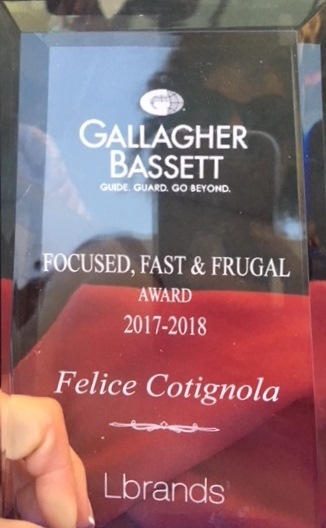 Congratulations to Felice Cotignola. Last night at the LBrands/Gallagher Bassett Claims Summit in Columbus, Ohio, she was honored with an award for her swift resolution and focused defense strategies in handling the client’s cases. This award was given to only one general liability attorney nationwide. The award was presented by Jeff Hilton, Vice President of Limited Brands, Mark Meadows, Senior Claims Manager of Limited Brands and Scott Hudson, the President and CEO of Gallagher Bassett Services, Inc.